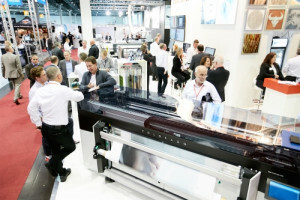 From 8 to 10 January 2019, three important industry events will take place concurrently in Düsseldorf for the first time: PSI, Viscom and the new PromoTex Expo. Together, the three standalone events represent one of Europe’s largest trade show networks for marketers and advertising experts. More than 1,000 exhibitors and about 25,000 trade visitors from around world are expected to attend. The three trade shows are aimed at bridging the gap between what’s technologically possible and what can be implemented in real-world marketing. The emphasis at PSI will be on Promotion & Sales. PromoTex Expo will be focused on Textile Goods & Textile Finishing. And viscom’s core competencies are Signmaking & Large Format Printing. Two trends will influence the activities at the show, in particular: mass customisation and sustainability. The golden rule of the advertising industry states that “money follows eyeballs”. Textile advertising on clothing or bags, for example, doesn’t just strike the eye, it also means ensured long-term customer attention for brands. PromoTex Expo will show marketeers and advertisers what’s possible with promotional textiles. Central at the new International Trade Show for Promotion, Sports and Workwear will be personalisation and sustainable textile production trends and the vast and diverse range of textile finishing options. Creative special exhibits and expert panels covering key industry topics such as smart textiles, fair trade and best practices in corporate design round off the programme. Viscom covers everything modern advertising technology can do today and reveals the possibilities of digital printing, even for small businesses. Europe’s Trade Fair for Visual Communication features a comprehensive nomenclature: from large-format and 3-D printing to digital out-of-home solutions to award-worthy POS displays. One exhibition segment is dedicated to brand communication at the point of experience. Knowledge forums such as the Best Practice Forum Marketing will use concrete examples to illustrate the trends that are gaining a foothold in the market. With the Superstar Award, Viscom also showcases the excellent opportunities that exist to present goods in physical retail. Networking events, including the Packaging Lunch designed to facilitate talks between agencies, designers, brand manufacturers and industry, complete the programme. The world of promotions is experiencing a paradigm shift at this very moment: in the middle of the digital age, demand for advertising vehicles you can touch is greater than ever before. Consumers, especially millennials, are once again looking for real and multi-sensory experiences that bring brands to life. PSI offers an abundance of product premieres for marketers and advertisers. It also serves up suggestions for customisation through finishing. 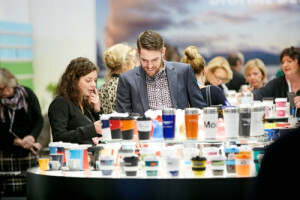 One strong trend currently favours high-quality, durable promotional products from eco-friendly production, according to the findings of the PSI Industry Barometer – a market study of manufacturers, distributors and agencies from the international PSI Network. More than 90 percent of the surveyed suppliers and distributors now have certified or verifiably sustainable products in their assortments. The winners of the PSI Sustainability Awards will be in Düsseldorf to demonstrate what a sustainable campaign can look like. Only PSI members and certified agencies will be granted access to the trade show.